We’re all about making our guests feel right at home, which is why we offer so many tasty options on our menu. We like knowing that no matter how big your family is, everyone in your household will find something they like at Stonefire Grill; even your pickiest eaters. Well, to make you feel even more at home, we’ve added a new menu item you’re sure to love, because you basically get to make it! 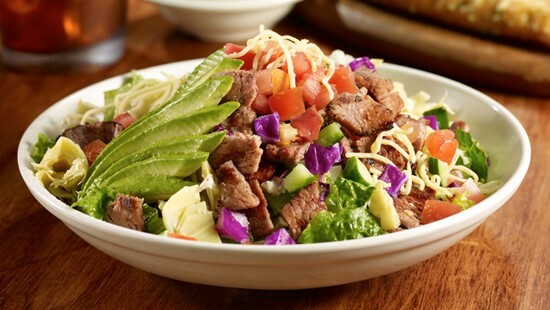 Stonefire’s Craft Your Own Salad is the latest addition to our menu. Let’s walk through the process so you know what to do the next time you’re in. First: Pick your greens: You can pick from mixed greens, chopped greens, arugula, spinach, romaine or kale. Next: Choose five ingredients, including one cheese: Top your salad with 5 of your favorite ingredients for endless combinations. Want more than 5 ingredients? Add them on for only $0.49 each! Ingredients: Almonds, artichokes, beets, black beans, black olives, carrots, cilantro, corn, croutons, cucumber, egg, garbanzo beans, golden raisins, green pepper, Kalamata olives, Mandarin oranges, mushrooms, pepitas, radishes, red cabbage, red onion, red pepper, roasted chickpeas, snow peas, sundried tomatoes, tortilla strips, wontons. Cheese: You can’t forget to add your choice of cheese! Choose gorgonzola, blue, feta, jack, parmesan or mozzarella. Add a little extra: Looking to add some more protein? To make your salad even more nutritious and delicious, add on bacon, avocado, or a wide choice of options to add on top, like chicken, tri-tip, quinoa or our Mediterranean Chicken Patties, just to name a few. Sesame Ginger, Blue Cheese, Lemon and Olive Oil, Chili Lime Vinaigrette, Cilantro Vinaigrette, Buttermilk Ranch, Creamy Caesar, Dijon Mustard Vinaigrette, Olive Oil Vinaigrette, Roasted Red Pepper Vinaigrette, Lemon Tahini, or Balsamic Vinaigrette.